Maybe you can help me here. I have been grappling for quite some time trying to comprehend the cause for all the hatred towards Chassidim and Chassidus through the ages. I have not been able to understand what caused the outrage, including excommunications, bans, public floggings, book burnings, attacks and beating, even murder, yes murder, against Chassidim. Rabbis and laymen alike were beaten, forced from their jobs and marriages, parents would sit shiva for children that defected to Chassidism, and Chassidim had to fear for their lives. 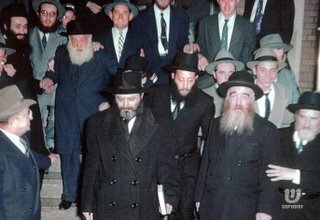 By most accounts that I have seen, it was a mistake based on incorrect information and lies that caused a majority of Gedolei Yisroel, even tzaddikim among them, to sanction any and all activities to stop the spreading of Chassidism, and that there was actually no significant difference between Chassidic and Misnagdic theology, rather, it was mostly a revolution of ruach that was so offensive! So what possible logical reason can there have been for this behavior by Gedolei Yisroel? Since when can they take such extreme measures without hearing both sides and investigating the truth of the accusations? Does this damage anyone else's emunas chachomim as it does mine? 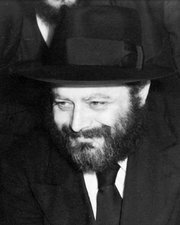 I find it quite ironic that people who claim to have had enough with Lubavitch cannot get enough if it,. maybe I'm the same way with "Misnagdim"? ווי א האן אין בני אדם refers to those who never learned Chassidus and have never really known or learned from those that have. 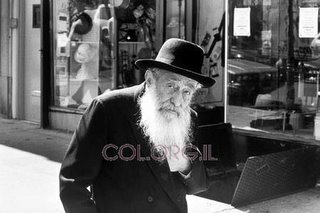 Only someone like that can show the boorish disrespect to Gedolei HaChassidim from previous generations, great men who besides for their Mesiras Nefesh were great Talmidei Chachomim as well. For him to write about Zalman Meyshe is like for me writing about what was going in Einstein's mind while writing his theory of relativity, I can speculate with my comparatively childish mind, but that where any basis in reality ends. The fact that so-called Lubavitchers will help his unworthy cause and try and bad-mouth people who helped the Rebbe build Lubavitch just because their family member may have been embarrassed or insulted by something he said or did is nothing less than just plain sad. Who needs enemies when we do ourselves in? Today marks 20 years since the passing of the (2nd?) 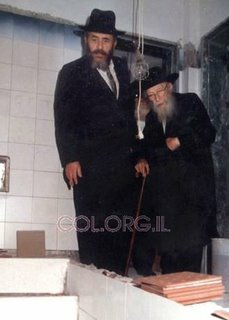 Rov of Bnei Brak, HaRav Yaakov Landa, z"l.
20 years since the civil cover was blown off certain elements in Bnei Brak. 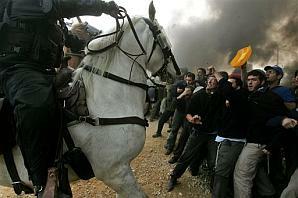 20 years of hate, division, Sinas Chinom and Chilul Hashem. You think I can just stay away from this stuff? A Chossid doesn't have it easy, he can't just put it into "auto-pilot" and his live his life for the next 80 years doing the same good thing forever. Was there some sort of pre-ordained master plan for Lubavitchers to have it harder in life, and to only reap what to sow? Do their select Neshomos, chosen for Tomchei Tmimim, also come with built-in select Yetzer HoRahs? 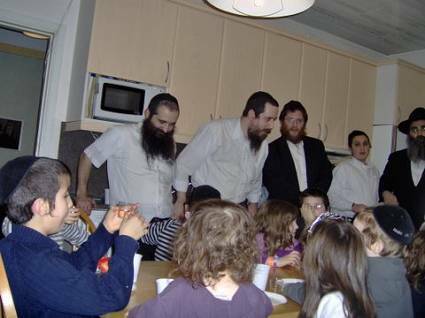 I see these Grubbe Baalibatishe people who don't put 5 seconds into their kids' Chinuch, yet they have wonderful, well-behaved children, how come? (This is not a "why do bad things happen to good people" question), yet with Lubavitcher Chassidim it's gotta be all hard work, and even that is never, ever guranteed in today's world, why? If this was a pre-ordained request of the AR, my question would be; why? 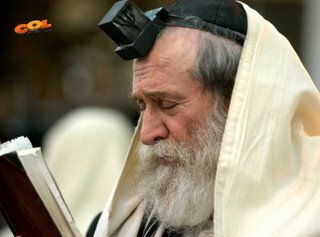 Is it to discourage מצות אנשים מלומדה or similar approaches to Yiddishkeit? It seems like the Rabbeyim were of the opinion that MAM is worse than no observance at all (well, not exactly) and that every day needs to be a struggle just to "stay afloat". There's a lot to add here, hopefully they'll be discussed in the pursuing comments. 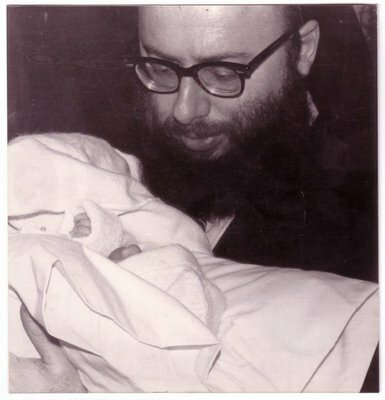 I hope that you too can see the beauty of these pictures, of what the Rebbe has accomplished מיט זיינע אידן.
" 5 shluchim (and kids!) joined together from 3 different countries, some traveling as long as five hours to join the farbrengen. Shluchim Rabbi Alexander Namdar and Rabbi Michoel Danow from Gothenberg Sweden, Rabbi Chaim Greisman from Stockholm Sweden, Rabbi Shaul Wilhelm from Oslo Norway, and Rabbi Yitzi Loewnthal from Copenhagen Denmark, participated.R' Yehudah Goldman, a local Lubavitcher, also participated. 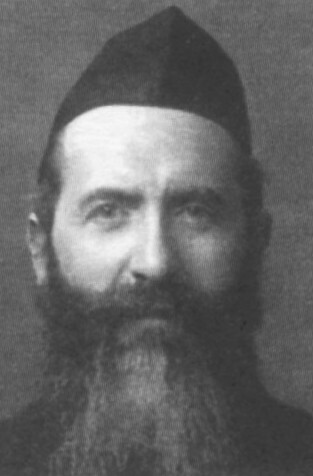 Rabbi Binyomin Wolf, in Finland, unable to find a flight, participated by the telephone the whole night. The Farbrengen was held at Rabbi Michoel Danow's house. The farbrengen started with stories and chips for the children, and then went on throughout the night. @ 5:00 am, a goral was made amongst the participants and Scandinavian Shluchim, for a ticket to travel to the Rebbe, to be at the Ohel over Shabbos, for Chof Hey Adar. 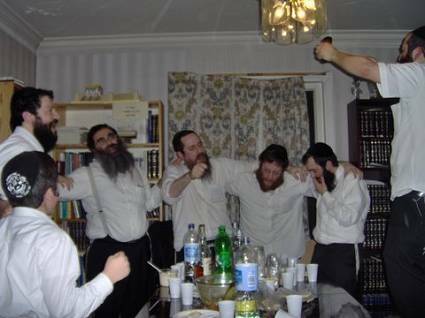 The winner was R' Yehudah Goldman. " If you see 5 people sitting together, telling stories, and having too much to drink, Gevalt are you far, far away. 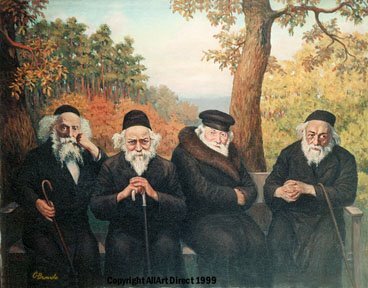 What you should see is 5 people who could've made an easy life for themselves close to home, instead sitting together in SCANDINAVIA, living on Mesiras Nefesh, only to bring Yidden closer to Yiddishkeit and Chassidus. They are struggling and toiling to raise Chassidishe, erliche Kinderlach, something they seem to be succeeding at. The Chasidishe Ahavah that they show for one another is what the Alter Rebbe had in mind when he was Meyased Chassidus Chabad, and is what the Rebbe Rashab had in mind when he was Meyased Tomchei Tmimim. Chof Beis Shvat - why? 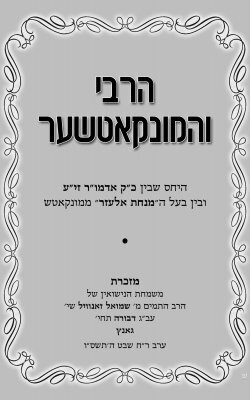 Many a man will ask why the observance of CB Shvat, a Yohrtzeit of a Rebbetzin? is she too one of the Rabbeyim that we observe her Yohrtzeit, visit her Tziyun, and learn the Mishnayes of her name? I too had trouble understanding it once upon a time, but I attribute that difficulty to my background and education. Why her more than all others? Many will say that it was her royal qualities and the way she conducted herself in her day-to-day life. The fact that she was hardly seen in public attributed to a mystique that has yet to reach its peak. 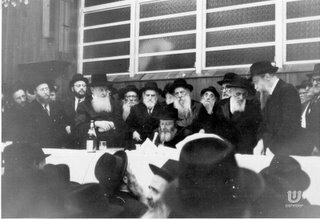 With others it was the fact that with her passing the "golden days" of Lubavitch ended, with no farbrengens during the week, and no more Mamorim, save for a couple. One thing is for certain; Lubavitch owes her a tremendous debt of gratitude, and is repaying that debt. Without her insistance who knows if the Rebbe would've accepted the Nesius, and the outcome of the Seforim court case might have been very different. There is so much we do not know about her support and help of the Rebbe in all matters. There is no more appropriate way of repaying that debt than the current way. This blog was originally founded to fight Tzemach and others like him. For a while he was tired of the same old Berel Lazar-bashing so he went on to other things. Maybe it was the effect of the Yud Tes Kislev Melava Malka that told him that Lubavitch wasn't all "evil", but that now seems to have worn off. He has recently seemingly been ticked off again by something or someone and has launched a very shallow and hollow series of posts, ranging from Lubavitcher Frei-outs, to RUSSIAN Lubavitcher Frei-outs, a really wide range of topics I must say. I do think to myself that וואס זענען ניט-חסידים שולדיג that TA is bashing Lubavitch, but there's more to that. I do that to uncover the hypocrisy that they practice, but enough with that for now. Before you go and attack me for trying to prove that a Gevorener ken eychet faynt huben Misnagdim, just remember that I could have been scouring the net and posted very unflattering story about Satmar, Ponovezh and others, and there have been plenty to write about. I could've gone and posted chapters of the Making of A Godol, with all their embarrassing stories, and there are plenty. Yet, I have not, just remember that. I seem to upsetting those Lubavitchers who worry about Ahavas Yisroel. They say that the Rebbe would not have approved of the "misnaged-bashing" that goes on here, and maybe they're right, but may be not. I don't go after those that don't bother me, for the most part, just those who claim to defend Yiddishkeit from the dangers of Lubavitch. 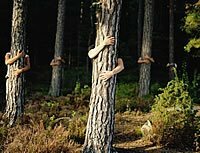 The way I see it is that those tree-hugging "Peace-Loving" people are in some ways responsible for the destruction of Lubavitch as we knew it. Now, before you jump out of your seats or smash your monitors, hear me out. We all know that all troublemakers, even children, take advantage of superiors or adversaries being "nice". You being nice to them makes them feel like they have the upper hand and they'll take you for everything you got. Try it on your kids, you'll see I'm right. The same goes for all battles, be they religious or mundane, when you keep on being nice, you'll get pie in your face. This is the rationale behind some of the "Misnaged-bashing" that I do. I live in Charedi society, and consider myself very much a part of it, but there's only so much hate a person can take. Be it a Shivah, or lehavdil a Chasunah or other Simchah, people never seem to miss a chance to bash Chabad and the Rebbe, and even when "forced" to compliment will do it with a side order of critique. Replace the Rebbe and Lubavitch with your local "Godol" or Yeshiva or Chassidic group and see how you feel. 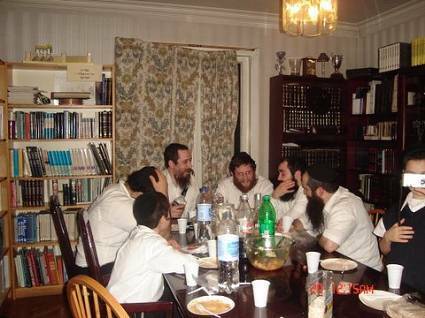 Most Lubavitchers live cut off from the rest of the frum world, whether in CH, Kfar Chabad, or even when they live in cities like Montreal or Chicago they instinctively keep to themselves, thereby missing out on seeing what their neighbors think of them. Most of the time they don't care about their frum neighbors, for whatever reason, and people like that usually see no reason to provoke their neighbors. What they fail to realize is that them being cut off from the rest of the frum world yet, no where else, diminishes their value and sets them up for attacks. The same goes for what goes on in the Rebbe's shul and elsewhere in the world of Lubavitch. As long as you insist on just having Ahavas Yisroel the rabble-rousers will take advantage of you, because they know you'll stand by and do nothing. Ahavas Yisroel must be practiced, but not at the expense of sanity. סבא נשם חסידות 24 שעות ביממה. השכים קום עוד בטרם זרחה החמה, למד שעתיים רצופות מאמרי חסידות והתפלל באריכות. מעבר ללימוד המעמיק בבוקר, הוא הקדיש שעות נוספות לשיעוריו הקבועים: ליקוטי תורה וספרי חסידות רבים. כשייסד הרבי את תקנת לימוד הרמב"ם היומי הוא שאל היכן יוכל למצוא זמן ללימוד, וכחסיד שבטל לרבו עסק בלימוד הרמב"ם בלהט ובחיות. את כל כולו הקדיש לחסידות. עם שיעור התניא היומי היה מתבונן בתפילה ובמשך כל היום היה עוסק, מתבונן ומתעמק באותו קטע. סדר יומו בשבת קודש היה מופלא: קימה לפנות בוקר, שעות ארוכות למד חסידות ולאחר-מכן התפלל באריכות, לעיתים עד ל-3 אחר-הצהריים. אז היה יושב להתוועד. הוא הרבה לדבר על חסידים שפונים אל הרבי בעניינים גשמיים, בעיקר בחג הסוכות. דבריו של אדמו"ר הזקן בתניא היומי על החסידים שביקשו על עניינים גשמיים העסיקו אותו לא מעט. "הבעיה היא לא כשמבקשים על דברים גשמיים', נהג לומר. "הבעיה היא שרק עניינים אלו מעסיקים אותם. חסיד צריך להיות מקושר לרבי, בראש ובראשונה. רק לאחר-מכן, מתוך העובדה שהחסיד מקושר לרבי, הוא מבקש גם על גשמיות. אבל לא מתחילים את הקשר עם הרבי בגשמיות". What I remember most is him crying like a baby on Gimmel Tamuz 5754, crying that he'd lost his third Rebbe, crying that the world as he knew had come to a crossroads. He made the most of the next 11 and a half years, filling his time learning and davening. 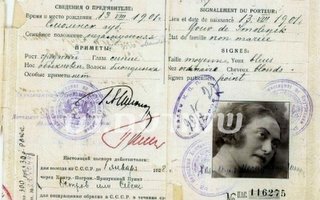 He figuratively had many lives, beginning in Russia, then in Montreal, and after his wife's passing starting anew in Crown Heights. 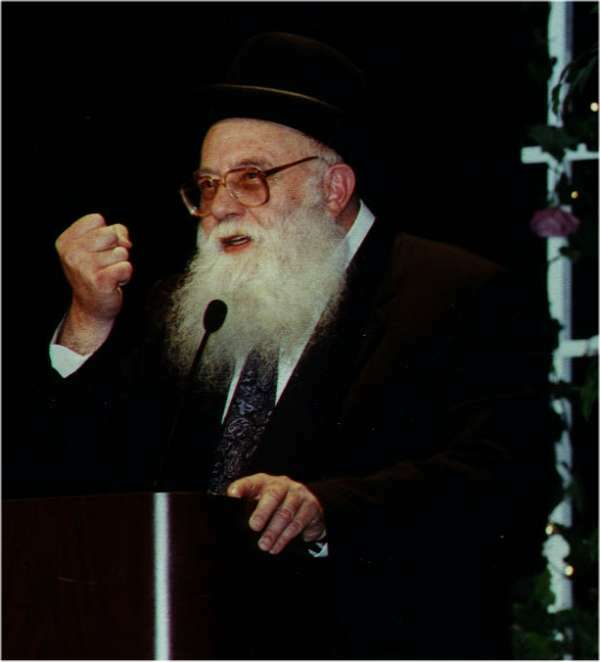 The common denominator of all those "lives" was his devotion to Yiddishkeit, Chassidus, the Rebbe, and Tomchei Tmimim. He was an example of how we must try to live our lives. Otherwise known as Tu BiShvat. Interesting how the Charedim didn't completely eradicate it after the "Tziyonim" hijacked it and made it into their Holiday. I think I know why. Environmentalists love it too, it makes them feel good about the Torah being all "green". RYY Grunwald of Columbus, OH brings in his לתולדות הריפורמציאן הדתית בגרמניא ובאונגריא an interesting point. He mentions the fact that one of first (lesser known) changes that the reformers in Germany made to the Synagogue service was the abolishment of the "Trop" during Krias HaTorah. If so, he says, why do the "Admorim" do the same thing when they Lein?! While on that subject, it is noteworthy to mention that previous generations Chabad Chasidim were known to be בקי בתנ"ך from a young age, and extreme importance is placed on Trop as well as Dikduk during Krias HaTorah, something that the Talmidei R"R Elimelech of Lizhensk totally negated because of the emphasis placed on them by "Maskilim" and reformers. Only 48 Years old, Chaval! Growing up and attending Chasidishe Farbrengens I would hear about the "Misnaged" who always thinks he's right in how learns Pshat in what he's learning. Whether it's Rashi, Teysfes, the Rambam, or any other Rishonim or Achronim that he disagrees with, it's them that didn't see it correctly. It's cute to hear once or twice but, like anything else, things get tiring after a while. Add to that the fact that you didn't think things like that happened anymore, and you've got a real yawner. A classic story heard by me many times is the one where HaRav Yechezkel Abramski comes to the Lubavitcher Yeshivah in Lod to deliver a shiur. In the middle he mentions a Rabbeinu Chananel that seemingly disagrees with what he's saying.The good Rabbi announces boldly: "מיינט איר דאך אז רבינו חננא-ל זאגט ניט ווי מיר, ניין! ער זאגט יא ווי איך זאג". He then proceeds to show the shiur that he's correct in his Svoroh. That was a classic, because it showed them what Limud HaTeyreh can look like if it's done as a Kardum Lachpeyr, or as a way to boost one's image and self-esteem, RYA's gadlus not withstanding. From reading up on the subject of Yeshivas in pre-war Europe one can make an interesting conclusion, that Koved HaTeyre was observed very differently. The Koved was a self-serve version, you had Koved for your own Teyre. You were to dress the part of a Choshuver Bocher because YOU were a Ben Teyre, and you were to degrade the simple folk of the town because they were Ameratzim. 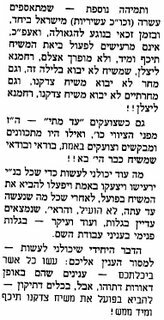 It was OK to call a Bocher a "Puyer" or a "Yape" or a "Terk" or a "Poroh Adumoh" because he asked a Kashe that's not to your liking, and even if a Bocher was caught up in Haskalah he was still Yeshiva material if he had "Ahavas HaTeyre." Now, some of these attitudes have changed, for different reasons, but the underlying theme is the same. A BaaleBos has no intrinsic value other than to be a Yeshiva funder. If he's a Machshiv Teyre and spends time learning himself then he does earn some value, but only minimal, (and only if he dishes out $100,000 for an eidem.) Recently though, the Lithuanian Yeshiva world has morphed into "Chassidim without Shtraymlech", and if I were once part of that world I wouldn't be happy either. 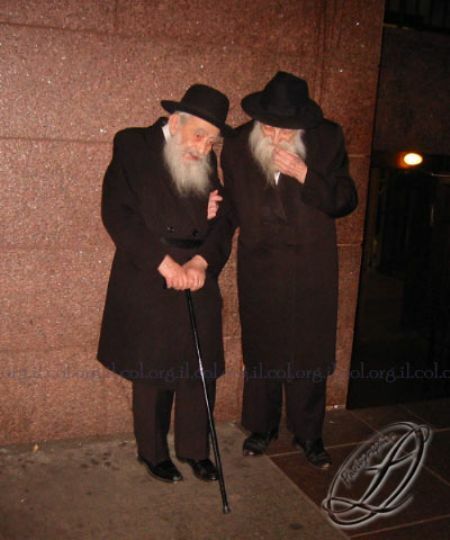 Amohl, when a Bocher came to you with a Hamlotzoh from a Choshuve Rov, and you tested him, and he didn't pass the exam with flying colors, it was normal to call that Rov an AmHoretz. Today there is one opinion on all issues, issued by 1-2-3 Rabbonim, and all others must fall in line. 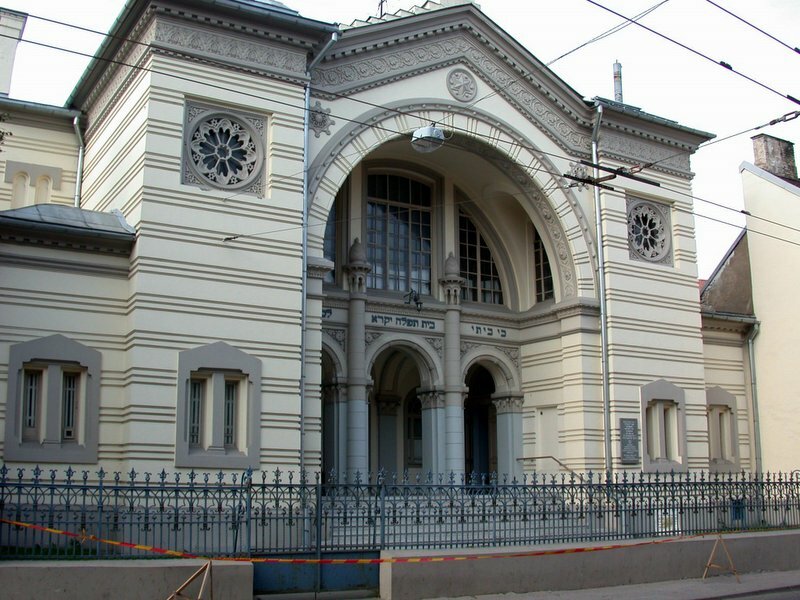 What Rabbi Kamenecki wants to do is to bring back the old attitudes of the Roshei Yeshiva and that of Yeshivaleit not needing to answer to one opinion of one Rabbinic body. Every lamden can have his opinion, both in Inyonei Hashkofoh and in learning, and anybody that differs with him can be an Amihoretz. Maybe that's what we need now in Charedi society, a shakeup of monumental proportions with a good earthshattering Machlaykes on the side. Yehuda Shain has long had a bone to pick with Rubashkin. My sources say this is due to him being canned from his Hashgochoh job with them. He considers himself the foremost expert on Kashrus matters and people buy his racket, lock, stock and barrel. His main beef seems to be with Rubashkin being a Meikil, all the Machshirim there notwithstanding, and he even brings the PETA video as proof of "problems" down in Postville, Iowa. He too has started a blog, appropriately named YudelStake (get it?) to go along with his website. I guess when you "stand up" to Lubavitch people listen. We wish him nothing but, ----- oh never mind. Reb Shimon Goldman came to our shul Tuesday night to discuss his Zichraynes of the Frierdige Rebbe. He's not a Mashpia, nor a "Redner", yet I was excited, although I'd never heard him Farbreng before, because based on the book I was hoping for a night full of stories. It seems like his son who compiled the book must've worked for a looong time "pulling teeth", because Tuesday night he wasn't talking much. What he said was straight out of the book, which is reassuring, because thus we know that it wasn't emellished at all, but the Misnaged-basher within me wanted more. I wanted him to spill the beans and tell what he knows, the consequences be da--ed. He spoke a bit about his trip out of Poland, and how he joined the Lubavitcher Yeshiva in Vilna. He spoke of his meetings with the Torah giants of the day, people like the Mashpia Reb Shua Eizik, but his words lacked a proper flow, meaning, if you didn't know the people and places being dicussed you were left with large pockets of "what's he talking about." 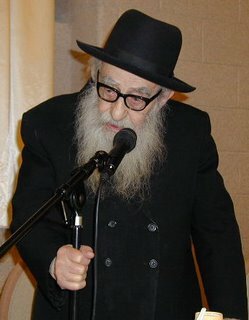 He mentioned names like Reb Leib Malin z'l with great respect, and the fact that although the Chassidishe and Litvishe Yidden in Shanghai differed on when to keep Shabbos because they chose to adhere to different Poskim, Reb Leib and others would come to the Lubavitcher Yeshiva to hear Krias HaTorah on Shabbos. It does make you think that had it not been for the Roshei Yeshiva and "Askonim" in New York things may have worked out very differently. Years ago we might have said "of what good is it to expose these stories", and seemingly most other groups with differences have buried the hatchet. However, for some reason, when it comes to Lubavitch then "the truth must be known". We Totally missed the point! did the Rebbe get what he wanted? Much ado is made of the supposed immediate grasp that the Brisker Rov R' Velvel had of the Rebbe's immediate "intentions." The story supposedly goes (don't they all?) that the Brisker Rov was shown a copy of the מאמר באתי לגני that the Rebbe said on that first Yud Shvat. He supposedly looked through the Maymer, saw the end, where the Rebbe says that since we're the Dor Hashvi'i we need to be "mamshich the shechinah into Oilem HaZeh Hatachton", "Venizkeh zehn zich" etc. and said that "er meint az er iz moshiach", or worse. Without being able to verify if the story actually happened, there is one observation to make. 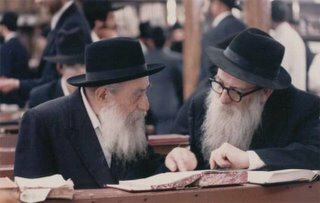 The truth is that Chassidim did take that line of "והוא יגאלנו" very seriously and from then had the idea of the Rebbe as Moshiach entrenched in their minds, but was that it? Was that the only lesson that people took home from that Farbrengen? The Rebbe spoke of many Inyonim, not to mention a long, טיפע מאמר. It was the first Yohrtzeit of the FR and the anticipation was great. Not much was known about the Rebbe, and the Rebbe supposedly still had many "friends" in the Heimishe community, yet the only thing the "Godol HaDor" could think of to say was the above-mentioned line?! I choose not to believe the story, for the Kovod of the Brisker Rov. I hope to ask our friend R' Shimon Goldman some questions tonight. Can there be true Emunah in Achdus Hashem, Hashgocheh Protis, and Nitzchius HaTeyre without Chassidus? I say no. Judge for yourself. In the Maymer רבא חזיי' לרב המנונא דקא מאריך בצלותי אות ט"ז the FR explains that unlike man-made laws which differ from country to country and are made according to the lifestyle of its inhabitants, Chukei HaTeyre are made to create a certain lifestyle. 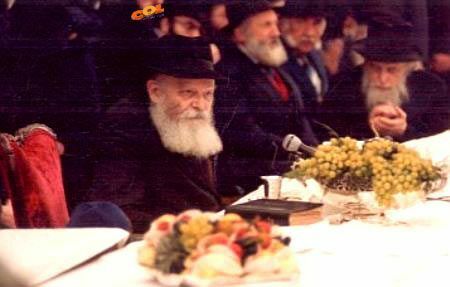 In the Rebbe's words; די מענטשליכע געזעצען ווערן פון לעבען, ווי מיר זעהן אז אין יעדער לאנד איז דא א בית המחוקקים וואו דארטען ווערען געשאפען אלע געזעצען ווי עס איז בעסער פאר די איינוואוינער פון לאנד. . עס איז פאראן א געזעץ וועלכער שאפט א לעבען, דאס הייסט אז עס נעמט זיך נישט פון לעבען נאר עס שאפט א לעבן, און דאס איז תורת ה In other words Torah's laws are not based on what man decides to legislate, nor on the problems of the times. A Young Ben-Teyre attending the shiur for the first time asked about the Rambam in Meyre Nevuchim who states that the Mitzvah of Korbonos was instituted to combat the idea of sacrificing to idols, something prevalent amongst the Goyim. If so, he says, then we see that the Torah only made this Mitzvah because of Hanhogas Ho'Odom, so why does the Rebbe say otherwise? He wanted to say that once the Torah makes a mitzvah it does not revoke it because Torah's laws are Nitzchi. In reality, however, we wouldn't need it in the 3rd Bais HaMikdosh either. In other words, according to him, Nitzchiyus Hatorah is only Lemaaseh, but Taamei HaMitzvos are not. 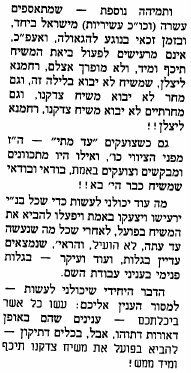 The Maggid Shiur tells the young man that according to the AR the Teyre was only revealing "Efes Kotzeyhu" of the Ta'amei HaMitzvos, so that the Yid can have somewhat of an understanding into what he's doing, but not to think that only for that reason was the Mitzvah commanded. The Torah and its reasons are Nitzchi, but you wouldn't know that if you don't learn Chassidus. The next morning I was told by a friend that the Izhbitzer in Bais Yaakov also addresses this subject, he says that Hashem didn't ch"v scramble to "create" Korbones when Jews started idol worshipping, rather it was instituted to harness the good that comes from sacrificing animals, something that Ovdei A"Z channel the wrong way. They say in name of Reb Chayim Brisker z"l that someone who's an Apikeyres because he's an Amehoretz and never learned the dinim is nebbach an apikeyres, but an Apikeyres nevertheless. I think the same may be said for those that fail to learn Sifrei Chassidus. Although you may think that you believe, you may be surprised to find that once the questions start, either from an inquisitive friend of yours, or from a non-religious co-worker, you'll find yourself questioning your own faith as well. 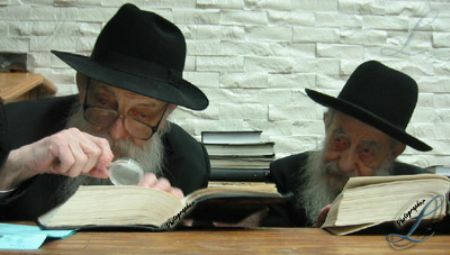 For some reason many will tell you, and these people include fervent Chagas Chassidim, that learning Chabad Chassidus provokes questions that are best left unasked, "stick to the basics" they say, and you'll be free of worries. Am I saying that all those who don't learn Chassidus are Apikorsim? No, I'm not. A Yid has Emunah B'Yerushah. Am I saying that all Chassidim are home free? Not at all. Chassidim don't get a free pass, they too need to learn Chassidus בשופי. All I'm saying is that you cannot be a believer in Achdus Hashem, Hashgochoh Protis, and Nitzchiyus HaTeyre without learning Chassidus. Limud HaChassidus thus becomes not only a luxury, but a necessity for every Jewish man, woman, and child. That's why we do Hafotzas Ma'ayonos HaChassidus, and that's why in these days learning Musar, even Chovas HaLvovos, is not nearly enough. 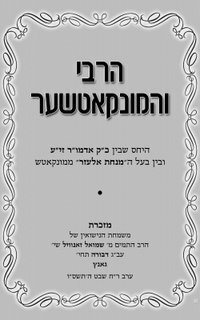 Shturem brings a series of articles in "Kerem HaChassidus" by Reb Eli Chaim Carlebach z"l.
An interesting article with interesting conclusions on his part, including the quote that the time of the Rebbe's campaign LeAlter LeTshuveh etc. 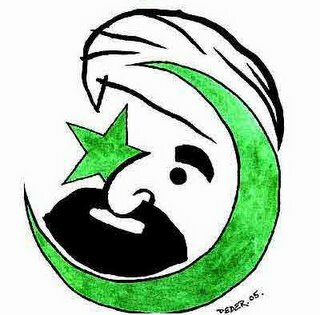 was a Sha'as Pekidoh, but because it was an auspicious time for Geulah it also lead to the annihilation of European Jewry. He "attributes" the FR's campaign to the fact that he was the grandson of both the Chernobler Maggid and the AR, who were promised by the Mezritcher Maggid that Moshiach would be one of their desendants. All in all a very fascinating piece. r-l; Reb Eli Yachel Simpson, Reb Hendel Liberman-Futerfas, Teleshevsky, the Rebbe. Within the irreligious population "The Zionist Idea" has been dead basically since Oslo, at least that's the first we've seen of it. Although the idea of "Yeridah" has been going on ever since the "Aliyah" started, it was done mostly to look for better financial pastures. Today most young people in Israel have no love for Israel as a homeland although they claim to love it as their country, especially when it comes to defaming the religious. Now we've seen a new phenomenon, propagated by the left for the better part of 10 years now, that of self-denial and hate. Never has a people been so unsure of itself and of what it's been doing and has done for 100 years. History books are being re-written by rabid leftists with the "exposure of the evils done to the Arabs", the originals inhabitants of the land. 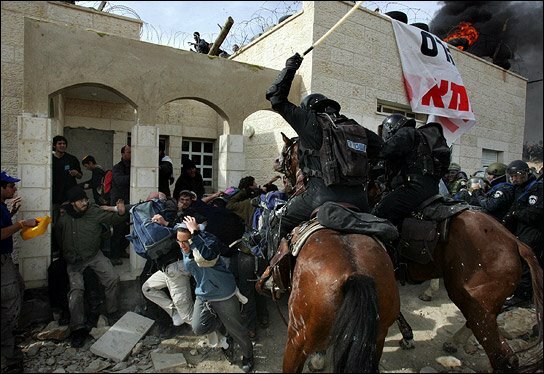 That idea has not sunk in fully yet, simply because that would defeat the whole purpose of Israel, but the idea of the Occupation being evil has sunk in fully, with the inhabitants of the territories seen as "provocateurs" and worse. It used to be that the Charedim were worthless and could be beaten to death because they were "parasites" and didn't contribute to society. They just had children and sucked the blood out of the Israeli economy. They didn't serve in the IDF and just "Kvetched Benk" in Yeshivos, also worthless institutions in their eyes. Today we see that the fact that people give their lives for the country makes no difference. The fact that they serve in the IDF and excel at it makes no difference. The fact that they contribute to society and keep on coming from other countries makes no difference. "It's the Yarmulke, stupid." So, now the Religious Zionists are at a crossroads; either they realize what the population in Israel thinks of them and recognize their collective mistake, or make as if none of this affects them, and "turn the other cheek." 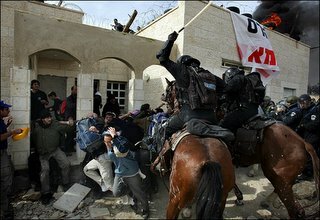 The problem with option 2 is that the idea that the State is the "Aschaltah DeGeulah" and that the IDF is the "holy army" is embedded deep within their collective psyche, and that does not go away just by expelling Jews and beating the living daylights out of them. Renouncing the state and it's institutions would also somehow mean that all the Rabbonim who supported the Zionist dream were wrong, with Rav Kook at the top of the list. So is the name of a Kuntres printed in honor of the wedding of 2 children of Anash originally from Hungary/Czechoslovakia. The Choson's father was a Mashgiach In the Yeshiva of Reb Mendel Vechter in those turbulent times and was a major influence in the lives of the Bochurim there. He is now Reish Mesivta in Morristown, NJ. The Kallah's father, a Talmid Chochom in his own right, studied in the Great Lithuanian Yeshivos of Brisk-Yerushalayim and Lakewood before "joining" Lubavitch as a Yungerman. He "shtams" from the illustrious Perlstein/Wulliger family of Munkacs, and is now the Menahel of Cheder Lubavitch and the Mesivta in Chicago. These cartoons awoke the wrath of Millions of Muslims around the world, including the boycott of Danish products, calls to fire newspaper editors, burning of Danish flags, and protests at embassies in the Middle East. This dude got sacked today. Thanks to a friend for the link. Times are very unnerving, friends. 1) RAK of Kletzk-Lakewood was his father's "bosom buddy from Slabodka"
2) His father was planning to move to Israel in 1956 and retire there. Had he done that and not been convinced otherwise by a Gynecologist friend of his from Slabodka "he would've taken over the leadership of the Charedi sector of Orthodox Jewry." 3) Lithuanians never hid their humanity from the people. "The basic doctrine of of Lita was not to hurt anybody even if it meant to allow someone to say that the world is millions of years old. 4) Had he moved to Israel in '56 neither Slifkin's nor Kamenecki's books would've been banned. 5) Based on science and the moon landing the Rambam was wrong in Hilchos Kiddush Hachodesh. He took his opinions from Greek Scholars therefore if science proves otherwise today the Rambam was wrong! 6) If we believe that the world is 5766 years old then "we're in big trouble." 7) The Gedolim who banned his book are in essence saying that if we know the truth about the sages of the previous generations then we're making them smaller. I say that was their greatness, despite their humanity they became great! 8) R' Chaim Kanievsky said אין פורענית בא לעולם אלא בשביל ישרא-ל , I say that if so why couldn't G-d kill only 20, 000 Asians, why 200,000? 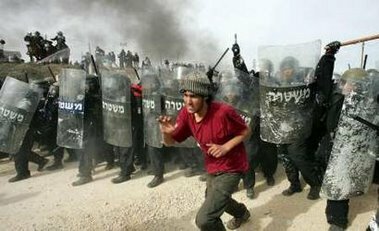 why not kill Arabs or Germans who have it coming to them?, "there was Hashgochoh in the Tsunami but not like the gedolim say to warn the Jews. Bemechilas Kvod Torosom!" Those nice boys at YU seemed a bit shocked at the concept of Goyim being punished just to warn the Jews. It doesn't go well with some of the secular studies they do, I guess. Tomorrow Beitar, Kiryat Sefer, Emanuel, and Neve Yaakov. Then the Charedim will scream, but it'll be too late. Shades of last summer, courtesy of Yahoo. Always worried about the animals. In Other news: Thank G-d for the Danish Press.